Pediatric AgeCalc is a tool that professionals and parents can use to calculate the chronological and adjusted age of children. Pediatric AgeCalc is available for download in the iTunes App Store for iPhone, iPad, and iPod Touch. Pediatric AgeCalc calculates age using the standard protocol used by psychologists and educators as recommended in childhood assessment manuals; it assumes 30 days in a month and 12 months in a year, it does not use actual calendar days. A child's chronological age is the child's actual age since birth. If a child was born prematurely (<37 weeks gestation), consideration should be given to using the child's adjusted age for tracking growth and development. A child's adjusted age is calculated by subtracting the child's degree of prematurity (number of weeks born early) from the child's chronological age. Whether or not one should use a child's adjusted age for growth depends on the child's birth weight. If a child was born weighting >2,500 grams, the child's growth should be plotted at the child's chronological age on the WHO (World Heath Organization) growth charts from birth to two years of age, and then on the CDC (Center of Disease Control) growth charts. If a child was born weighing 1,500 to 2,500 grams, the child's growth can be plotted on the same growth charts, but at the child's adjusted age until 3 years of age. If a child was born weighing < 1,500 grams, the child's growth should be plotted on special VLBW (very low birth weight) growth charts at the child's adjusted age until 3 years of age. Available here for boys. Available here for girls. If a child was born at <37 weeks gestation, the child's adjusted age should be considered when evaluating a child’s development until the child’s adjusted age is at least 12 months. While the literature is not conclusive regarding the best time to stop adjusting for infants born prematurely, rationale for adjusting to one year adjusted age include: (1) babies born prematurely differ from full-term babies physically, as such it is essential to use adjusted age when looking at issues related to feeding and sleep; (2) babies born prematurely differ from full-term babies developmentally, as such it is important to consider the child’s adjusted age when looking at developmental milestones; (3) the earlier a child is born, the longer the child needs to ‘catch-up’, hence the adjusted age of one year versus a chronological age of one year; and (4) using an adjusted age beyond the adjusted age of 12 months may result in a child not being referred for further evaluation and early intervention services at an early enough age. Most programs have guidelines regarding the use of adjusted age for infants and toddlers born prematurely, you should use the policy of your program. This section will walk you through an example of how to calculate chronological and adjusted age, both manually and with the Pediatric AgeCalc app. The goal is to help provide you with a better understanding of how the app calculates its results, while also showing you how much easier it is to make these calculations using the app than it is to make them by hand. To calculate the child’s chronological age, subtract the child’s date of birth from the date of testing. Example: Child's date of birth is June 11, 2013. The child was born at term. The date of testing is April 8, 2015. Step 1: Set up calculation. Step 2: Subtract "Date of Birth" Day from "Date of Testing" Day. Since 11 cannot be subtracted from 8, 30 days must be borrowed from the month. For calculation purposes, there are always 30 days to the month. Step 3: Subtract "Date of Birth" Month from "Date of Testing" Month. Since 6 cannot be subtracted from 3, 12 months must be borrowed from the year. Step 4: Subtract "Date of Birth" Year from "Date of Testing" Year. The child's chronological age is 1 year, 9 months, 27 days. Start by inputting the "Date of Birth". When you input the "Date of Testing", "Chronological Age" is automatically calculated. To calculate the child's adjusted age, subtract the child's degree of prematurity (in months and days) from the child's chronological age. Example: The child was born on May 23, 2014 at 29 weeks gestation. The current date is April 8, 2015. Calculate the child's adjusted age. Step 1: Calculate the child's chronological age. Refer the previous example if you do not know how to calculate this. Step 2: Calculate the degree of prematurity by subtracting the gestational age at birth from 40 weeks (full-term). The degree of prematurity equals the number of weeks the baby was born early. If medical documentation or the parent reports how many weeks the baby was born early, you already have the degree of prematurity and the following calculation is not necessary. Step 3: Convert the degree of prematurity in weeks to months and days. When converting, assume 4 weeks in a month and 7 days in a week. Degree of prematurity is 11 weeks, which equals 2 months and 21 days. Step 4: Subtract the degree of prematurity from the child's chronological age. The child's adjusted age is 7 months and 24 days. 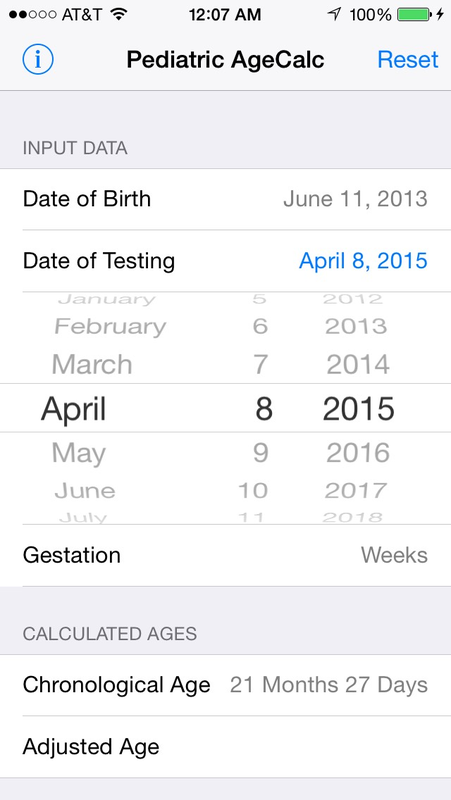 Start by inputting the "Date of Birth"
When you input the "Gestation", "Adjusted Age" is automatically calculated.